There will be some celebrating in the pubs in Newcastle tonight and around England for that matter after England moved smoothly into the semi-finals of the World Cup by beating Sweden 2-0. After a few pints, Newcastle’s (English) supporters can talk about winning the World Cup and Newcastle winning the Premier League next season – but we’ll need a lot more players to do that. This is the first time since 1990 that England have reached the final four – when Sir Bobby Robson took us into the last four but we lost on penalties to Germany. Two headed goals from Harry Maguire and Dele Alli today – one in each half – was the difference with England the better side. And it was a very professional and composed performance from this England team. 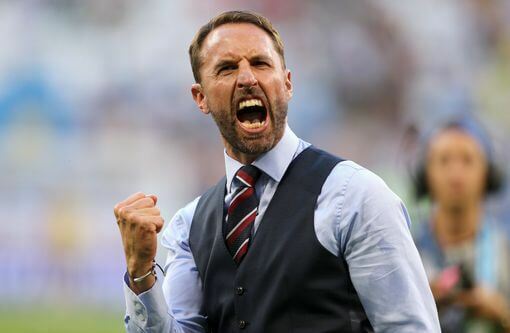 Gareth Southgate – celebrates goal – YES! No cause for any heart attacks in this game after we let in the equalizer against Columbia with less than 3 minutes of stoppage time to go. I’ll admit right now I didn’t think we would do anything at this World Cup – but Gareth Southgate has proved me wrong (what – again?) and the manager and the England players deserve all the credit. Southgate seems to have the players right behind him. This was England’s best performance of the tournament so far and like back in 1966 when we won it – players are starting to come into their best form as the tournament progresses. Harry Maguire had a powerful game and he’s dangerous in the air with his headers and Dele Alli is showing some of the form we know he’s capable of. And former Sunderland goalkeeper Jordan Pickford made three or four crucial saves in the second half and he seems to be at the very top of his game. His confidence oozes through the rest of the England team and he’s becoming a player who can play at his very best when it really matters – on the world’s stage. He reminds us of the great Gordon Banks who also seemed to play at the top of his game when he was in England’s colors. Spurs defender Trippier has come out of nowhere to star for England and John Stones has improved his game and cut out those mistakes. England will play Croatia or hosts Russia in the final four next Wednesday and then France or Belgium in the final. There’s no reason we cannot win it all! PS – England winning the World Cup will also help Newcastle in our first game when most of Spurs’ England stars should be missing – an added benefit for us. I don’t think I can ever remember a team in the world cup semi final that hasn’t played one good team yet ? You can only beat what’s Infront of you though, but it’s still a bit bizarre the way it’s panned out. Those of you that are laughing at Jib’s suggestion that he could be the man to go to Russia to console the Swedish lassies, remember that in his day he could have any woman he pleased. He just couldn’t please any!! I actually think Russia who are another bad lot will beat Croatia tonight. They’ll probably nick it in extra time or penalties. I hope I’m wrong though because I want to see a good game in the semi final. I can see us losing to a rampant Russia in the semis. Carlisle racecourse is good place to pop along to if your at a loose end this eve. Just an hour from the toon. Are you suggesting the referee might get some novichok sprayed on his half time custard cream if he doesn’t play ball ? Jib……… Nay Botha whatever floats yer boat. I haven’t seen much of Putin at this world cup to be honest. He must be keeping his head down. He’s probably minding all the Russian hooligans in a pad locked cage somewhere. Aside from the WC, Sunlun were having a pre-season training session today. Well Jib…can you really afford to be picky? Jesper are you blonde by any chance? Carlisle in raptures here. Great goal ! DaveD…Jib and I are not compatible! Spot on Ed. regarding Pickford. He’s turning out to be an inspired choice by the manager. And I think the best team in the cup is out. Thanks, Jib. How blue can you get? …..and that best team was ? Thrilled buy England result. Great defensively but struggle to put chances away. A lot like Newcastle last season. We were on top all day today and I expected a cagey affair. I reckon we look good for the final and I slam England all the time. Theres nothing mysterious about Munsters M.O. Already reserving the caveats in case the damned England go all the way! Agree though the semi final is looking to all intents and purposes a bye right now. Jesper. According to the press everyone is after Golovin. I do think Russia have some talent that goes under the radar though. Rebic was also good this tournament. I will say now. I think Townsend would be a good signing. If he performed like he did last time. Don’t care if he didn’t want to play championship. He was quality and probably better than the championship. Belgium will beat France. If we go through it’s us v Belgium again. Let’s nit make the same mistake. Break fast. Nick 2 goals. Goalkeeper no chance? He didn’t even jump! He he funny game this. We all know you’re a dab hand at posting other folks stuff as though it’s your own but you must be desperate with the BB King link – I seem to remember posting the same best ever in here a week.or two ago. I seem to remember posting the same best ever in here a week.or two ago.